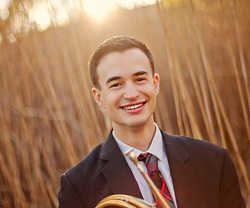 Russell Rybicki is currently a first-year Horn Fellow at the New World Symphony. He has played with the Rochester Philharmonic, Buffalo Philharmonic, Binghamton Philharmonic Orchestra and the Civic Orchestra of Chicago. He has participated as a fellow at the Tanglewood Music Center, National Orchestral Institute and Festival, l'Orchestre de la Francophonie and the Castleton Music Festival. He has won various competitions including the Brighton Symphony Orchestra Concerto Competition, National Music Festival Concerto Competition, and was selected to perform Esa-Pekka Salonen's Concert Étude during Mr. Salonen's residency at Northwestern University. Mr. Rybicki has also performed in the jazz idiom, and was a member with the Grammy Award-winning Gil Evans Centennial Jazz Ensemble at the Umbria Jazz Festival in Perugia, Italy. Mr. Rybicki is an active chamber musician with the Midic Winds wind quintet in outreach programs. He was a bronze medal winner in the 2013 Fischoff Chamber Music Competition and a finalist in the 2013 J.C. Arriaga Chamber Music Competition. The Midic Winds recently gave a concerto performance with the Eastman Wind Ensemble during their residency, as well as the Matinee Musicale concert series performing for audiences throughout the Duluth, Minnesota area. Mr. Rybicki completed his graduate studies at Northwestern University and his undergraduate degree at the Eastman School of Music studying horn and instrumental music education. He was awarded the distinguished performer’s certificate. His primary teachers include Gail Williams, Jonathan Boen, W. Peter Kurau and Derek Conrod. He has worked with artists such as William VerMeulen, Lowell Greer, Kristy Morrell and Adam Unsworth.